Hey! I'm back! We are still in Missouri and really liking it. I guess I have a love hate thing going on with Missouri so it's good. We are rejoicing over my new pregnancy! So excited to see what the Lord has for us with that! Always amazing! My daughters and I have started our own little sewing business! 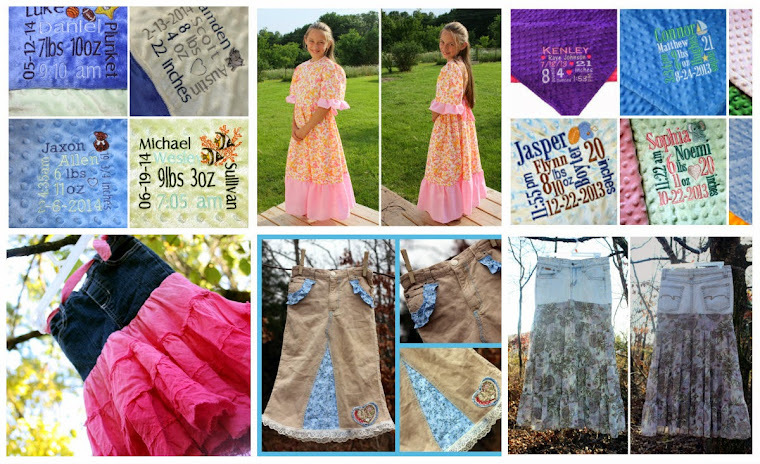 We are doing dresses, embroidery for gifts or whatever, homemade baby bibs out of jeans (so cute), and upcycled jean skirts! Along with several other things! We are enjoying it! We have a pretty nice sized garden. I am bummed that we only have 8 tomato plants. But we do have friends that have greenhouses and we are hoping to get canning tomatoes from them. We also just got our own chickens! 14 hens and 1 rooster! They are so fun to have and watch! We are really starting to take this homesteading thing serious. With the gmo's and high fructose corn syrup and who knows what else on our grocery store shelves there's no time like now to start growing food instead of lawns! Well, other than all of that we are still serving the Lord every day to the best of our ability! He has shown us a lot here lately and we are continuing to grow in Him! Just like the name I gave this blog, Striving to abide in Christ! By His grace we are still doing just that! Praise be to Him!